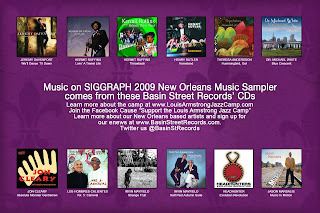 SIGGRAPH 2009 and Basin Street Records have teamed up in support of the Louis “Satchmo” Armstong Summer Jazz Camp to bring you SIGGRAPH 2009 New Orleans Music Sampler. We are donating all of the proceeds from this digital album to the camp. 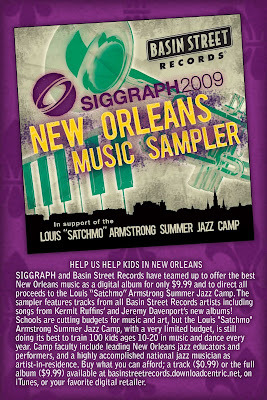 Please join the facebook cause “Support the Louis Armstrong Jazz Camp”. Download the digital album from our digital store, iTunes, Amazonmp3, or your favorite digital retailer.